Opioid addiction is a chronic medical condition that is a result of brain changes in susceptible individuals. Once drug addiction has developed, avoiding the pattern of relapse tends to be a long-term practice. It takes more than sheer willpower to break free from addiction.Luckily, certain medications and behavioural therapy can increase the likelihood of successful opioid addiction treatment and are able to help thousands of individuals maintain sobriety. The Dawn offers a highly personalised and intensive opioid addiction treatment that is tailor-made to suit each persons unique requirements. We offer a holistic and non-religious approach that is not only effective but also applicable to any individual.The Dawns licensed team of addiction professionals have extensive experience and can use numerous forms of counselling and therapies to help ensure a successful recovery, along with giving clients the vital tools that are required for a sober living following treatment. Aftercare support is also available online at no additional cost. We have an onsite detox centre and medical support available 24/7, along with an impressive 1:1 staff to client ratio. CBT teaches a person to recognise and discontinue negative thinking and behaviour. It helps an individual to become conscious of the stressors, feelings and situations that result in opioid abuse so that they can have a different response when they occur or avoid them completely. Contingency Management offers incentives to reinforce positive behaviours like staying sober. It uses a voucher-based method that allows patients to receive points if they have a negative drug test. They can exchange the points for items that support healthy living. Motivational Enhancement Therapy helps people with addiction disorders to increase motivation and commit to precise plans to participate in treatment and seek recovery. It is usually used early on to involve people in treatment. 12 Step programmes like Narcotics Anonymous (NA) & Alcoholics Anonymous (AA) are peer support groups that can be beneficial to people in recovery programmes by offering guidance and support. However, they are not to be confused with group therapy since a trained psychotherapist does not lead them. We believe in our program and are confident we have put together the highest quality treatment, clinical team, and facility offered to ensure the highest opportunity for success. Our clients lifelong recovery and success are what we care most about at The Dawn. We also realise that relapse and setbacks are a reality for many beginning their recovery journey, which is why we offer a relapse assurance guarantee for our clients who are being treated for drug and alcohol addiction. Our Relapse Assurance Guarantee ensures that a client who has completed our full programme, can come back to The Dawn for 30 days if they relapse for any reason, at no additional cost. During the month-long programme, we will help our clients identify the reasons for the relapse and get back on the right track of recovery. Contact us today to find out more about our Relapse Assurance Guarantee. Doctors usually prescribe opioids to help ease pain from injuries, surgeries, dental procedures or toothaches and chronic conditions like cancer. Certain prescription cough medicines also have opioid content. Regular use of opioids can lead to dependence, even if a person follows their doctors orders. Overdoses and death can be a result of opioid misuse and abuse. What are symptoms of opioid addiction? As with any form of addiction, opioid dependence affects a persons brain and behaviour. The first step that a person has to take towards recovery is recognising that they have a problem with opioids. The symptoms and signs of drug abuse can be psychological, physical and behavioural.Ai? ?Clear indicators of addiction include being unable to discontinue using the substance and stopping oneself from using more than the recommended dosage. Opioid drugs attach to opioid receptors on brain cells and in the body. Certain cells regulate a persons pain, digestion, and other functions. The human body already has opioid chemicals, like endorphins, which alleviate pain and make a person feel good when they exercise. When opioid drugs bind to these receptors, they lessen a persons pain perception even further, which is why they are helpful for people who are recovering from surgery or serious injuries. Opioids can also make people feel high, or euphoric, because of its effect on the brains reward system. Some individuals take opioids medications for the sole purpose of feeling that high. Any person who is taking prescription drug medication in order to get high is misusing it and is only putting themselves at risk for addiction and other health issues. What are symptoms of opioid overdose? Symptoms of opioid withdrawal can last from a week to a month. Emotional symptoms such as anxiety, insomnia and low energy can continue for months after a person has stopped using. Once the early stage symptoms of withdrawal have passed, many people may still face post-acute withdrawal symptoms, which are less severe but lengthier. What opioid withdrawal treatments are available? There are several opioid withdrawal treatments, or detox options, for removing opioids from the body, with some offering a more inclusive system than others. For example, standard detox can be done in an outpatient clinic or a hospital. Alternatively,comprehensive drug detox involves both psychological and pharmacological treatment methods while under close observation of both mental health and medical specialists in a safe and consoling residential setting. Even though unassisted withdrawal is not necessarily life-threatening, it can result in relapse. Therapy and opioid withdrawal medications, which are available in medical detox, may reduce chances of relapse. Additionally, opioid withdrawal symptoms can be extremely uncomfortable and medical detox may offer the safest and steadiest way to detox. During medical detox, vital signs, such as respiration levels, blood pressure, heart rate and body temperature, are carefully monitored and opioid withdrawal medications can be utilised to control body and brain functions. A mental health professional can also assess and stabilise individuals during medical detox. Although there is no exact timeline for detoxification, since each person experiences withdrawal from opioids differently, medical detox tends to last between five to seven days. What opioid withdrawal medications are used during medical detox? A person should not suddenly stop using opioid drugs without emotional and physical supervision and support since withdrawal side effects may be strong and can result in dangerous complications. During medical detox, opioid withdrawal medications may be helpful in controlling more difficult symptoms of withdrawal. These medications may include antidepressants, anticonvulsants, and other symptom-specific medications. Medical professionals may help a person gradually stop using opioid drugs by slowly tapering, or reducing, the dosage during medical detox. This process allows the opioid receptors to stay filled and stops the onset of serious withdrawal symptoms. Drug cravings and withdrawal may collectively be managed by substituting a short-acting opioid, like heroin, with a longer-acting alternative such as methadone. Buprenorphine is a partial agonist that is frequently used during medical opioid detox and addiction treatment as well, since it stays active in the body for a longer duration than most opioids and needs a lower dose. Furthermore, partial agonists do not typically cause the same euphoria, or high, as full agonists do, which makes them less prone to be abused. The effectiveness of buprenorphine also stops after some time, which also helps in acting as an abuse deterrent. Naltrexone and naloxone are opioid antagonists that attach to opioid receptor sites in the central nervous system and stop additional opioids from filling them. Therefore, if a person tries to take heroin, for example, whilst on an antagonist, the drug will not have the desired results and may trigger precipitated withdrawal syndrome instead. Precipitated withdrawal is the abrupt and rapid beginning of withdrawal symptoms, which can be severe and can be used to keep a person on an antagonist from trying to abuse an opioid agonist simultaneously. Naloxone is joined to buprenorphine as an inactive relapse-prevention agent in medications like Zubsolv and Suboxone, except when the drugs are changed and later abused via injection. Naltrexone products like Depade, ReVia and Vivitrol are commonly used to help avoid relapse once detox is complete and opioid drugs are completely removed from the body and brain. The purpose of substance detoxification is to stabilise a person who is dependent on opioids on both an emotional and physical level. Detox may use a combination of psychological and pharmacological therapy methods in order to achieve this. How does medical detox fit into a comprehensive opioid addiction treatment plan? Opioid addiction treatment must be comprehensive since drug dependency is a chronic and relapsing disease that has both emotional and physical symptoms and side effects. Medical detox is moderately short and can offer the right starting point for a steadier recovery. Relapse is common for people who struggle with dependency since it can appear to provide relief. After not using drugs for a period of time, a persons tolerance to certain intensities of drugs may be reduced and relapse following detox can be extremely dangerous since it can increase the chance of a fatal overdose.The New York Times reported that opioids cause more deaths than other drugs or medication. Medical detox can help ease withdrawal symptoms, decrease side effects, avoid serious complications and minimise drug cravings. It can be a great stepping-stone towards recovery and help to maintain long-term sobriety. A person can increase their chances of stopping opioid use and maintaining sobriety when detox is followed with counselling, individual and family therapy, education and support groups. These factors can generate continuing and almost irresistible cravings to use drugs. Opioid addiction counselling can help an addict avoid cravings and learn healthier ways to deal with life stresses, without using substances. There are numerous counselling therapies available for opioid addiction, and there is no single recognised method that is superior to others. Similarly, there is not one single approach that is suitable for everyone who is addicted to opioids. An ideal drug addiction treatment plan is personalised to address a persons addiction and their individual requirements. Counselling can be offered at an individual and group level. Individual counselling tends to focus on minimising or stopping drug use, committing to a recovery strategy, skill building, and family, social and educational/professional effects of substance use. Group counselling is beneficial in addition to individual counselling since it provides social support from peers who are also going through drug rehabilitation. Individual therapy is especially beneficial in cases of co-occurring disorder, which describes coexisting mental health conditions, such as bipolar disorder or depression, and often requires separate treatment from the drug addiction. 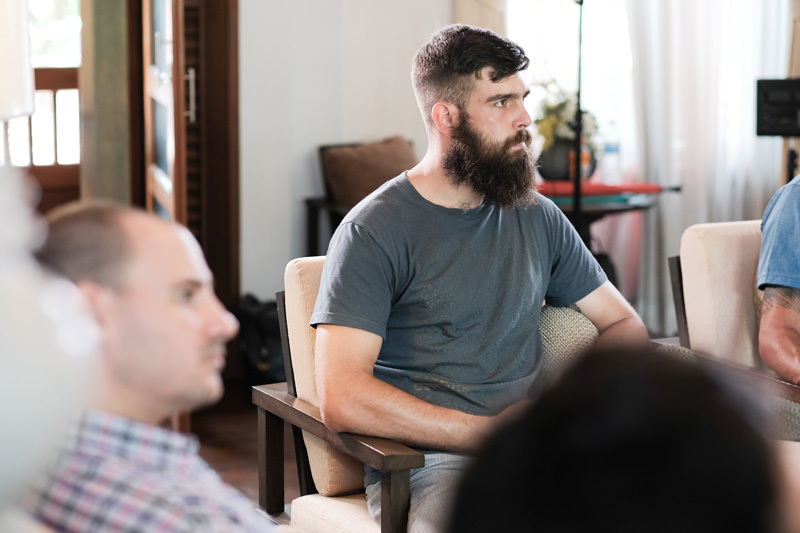 Inpatient rehabilitation separates an addict from the environment that permitted them to use and abuse drugs, and teaches them new skills or habits that are vital for staying sober. During inpatient rehab, an individual enters a specialised facility for a certain amount of time, which allows them to focus solely on their recovery. Since opioid withdrawal treatments often involve detox, it can be beneficial for the person to safely detox under medical supervision and continue with their recovery programme at an inpatient facility. Removing a person from their regular environment also separates them from triggers like places, people and events that could make them want to use drugs. They also have much less stress and a reduced chance of relapse or overdose. Additionally, inpatient clients have access to emotional support and various psychotherapy options. Outpatient clinic, on the other hand, gives addicts several treatments that are used in an inpatient programme such as therapy sessions and group meetings. However, they return to their own homes every night. This can be a plus for people who cannot leave their responsibilities yet want to work on their recovery. The main downside to outpatient programmes is the increase of risk, such as triggers and stresses that contributed to their addiction in the first place. It is not suitable for everyone and is often better suited to early interventions or after completing an inpatient programme.